Xi’an, CHINA, 2018-Aug-22 — /Travel PR News/ — W Hotels Worldwide, part of Marriott International, Inc., today (08/21/2018) announced the opening of W Xi’an, the brand’s seventh hotel in Greater China and the largest W to open in Asia Pacific. Owned by Vanzhong Real Estate and located in the Qujiang District, adjacent to Quijiang Pool Park, where modernity intersects with rich cultural tapestry, W Xi’an is set to ignite the passions of global guests and add a new beat to the pulse of a city whose history spans back over three millennia. Known to many as “the birthplace of Chinese civilization,” Xi’an was a popular stop along the Silk Road since ancient times, serving as a collective meeting place for both culture and cuisine, and growing richer and more diverse with age. Alongside world-famous relics of past dynasties including the Terracotta Warriors and the Ancient City Wall, Xi’an buzzes with an eclectic mix of local bites from Cantonese to Sichuan style spice and an emphasis on artisan products. W Xi’an is located near Northwest China’s largest international travel hub, Xi’an Xianyang International Airport, as well as Giant Wild Goose Pagoda, the Datang Furong Garden, and the ubiquitous Qujiang Lake, some of the most breathtaking sites in the region. Spread over approximately 80,000 square meters, W Xi’an gives a bold first impression of the W Hotels brand, standing in the shape of a ‘W’ along with the other two buildings of the W Five Park complex. With its neon coating shining each night, W Xi-an is quickly becoming an iconic feature on the Xi’an city skyline. Imagined by acclaimed interior design firm AB Concept, W Xi’an reinterprets the rich historical, social and physical contexts of the city through the modern lens of the W brand. The design fuses the past and future of Xi’an, showcasing the vibrant history of the region with dynamic visual displays taking guests through five ancient dynasties that once called Xi’an home. The hotel features five intricate labyrinths inspired by the Zhou, Qin, Han, Sui and Tang dynasties. An enormous eye-catching multimedia art installation with digital fragments of Tang dynasty architecture welcomes guests through a floating garden entrance. The 17-meter-high Living Room is a showpiece of the hotel’s inspired design, boasting lighted floating curves, hanging artistic details and sloping divisions sweeping up from the floor, each inspired by the famous palace wall and historic depictions of the nearby Silk Road. Artworks of acrobatic pottery figurines pay tribute to the “Welcoming Ceremony” in ancient times, luring guests to explore further. 385 guest rooms and suites bring W guests a bold representation of Xi’an culture. Large-scale artworks show off the renowned make up style of the Tang dynasty with a colourful modern twist from ATG Beyond, China’s renowned premiere applied design expert. Inspired by the supreme diplomatic gifting in Tang dynasty, peach motifs are displayed as signature W pillows alongside the brand’s signature beds. With spacious balconies carefully arranged for each guestroom, W Xi’an deliberately links each private terrace to the stage-like hidden mini bars so guests can treat themselves to a sip or bite while soaking in the skyline. The Extreme WOW Suite, the most lavish of the hotel’s 73 expansive suites, screams opulence with corrugated walls in a deep orange-red, embodying the energy of the Silk Road. W Xi’an showcases four places to socialize and dine. Wei, the all-day dining restaurant, infuses local cuisine with international favorites under an eye-catching giant satin vortex embedded in the ceiling. Expert chefs craft each dish from the restaurant’s multiple show kitchens, putting the decadent eats on display even before they hit the plate. Yen, the hotel’s signature restaurant, features 11 separate rooms with Tang dynasty accents, and is a showcase of Cantonese fine dining and innovative Dim Sum. FU serves up trendy hotpots providing guests with an interactive interpretation of the redefined traditional dish. With unparalleled views of Quijiang, WOOBAR®transforms from a laid-back hangout by day to a stylish lounge by night., seating guests with easy access to the dance floor and serving up both a global selection of spirits and a curated take on afternoon tea. Guests can detox, de-stress and rejuvenate the body, mind and soul at the indoor WET® swimming pool and outdoor WET®Deck. A digital screen at the end of the WET® pool allows for over-the-top events to reach a new level with projected graphics and the ability to host on-water fashion shows. The 24-hour FIT gym boasts a range of state-of-the-art equipment to keep guests ready for their next adventure. Guests can also choose to get pampered at AWAY® Spa, which features a myriad of relaxing and rejuvenating services between five treatment rooms, two rooms for manicure-pedicure paradise, a hair salon, and two makeup rooms for getting glam. With over 4,000 square meters of event space, versatile function spaces are fully equipped with advanced audio-visual facilities to set the stage for world-class events. The Great Room, with its towering ceiling and twisting chandeliers, has 2,330 square meters of space to accommodate up to 1,000 guests, making it one of the largest hotel ballrooms in town. 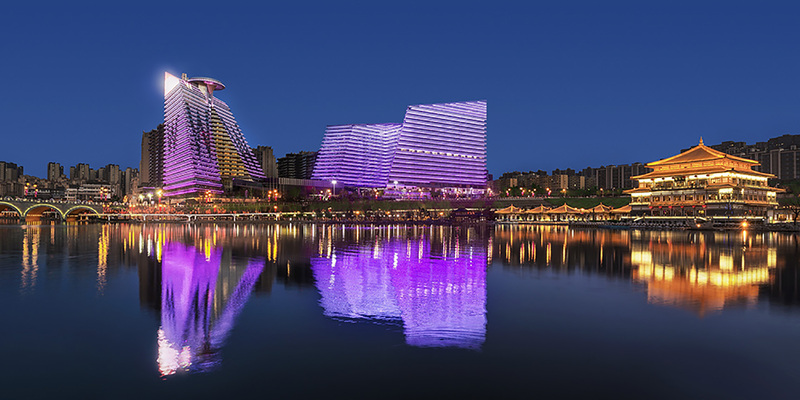 For more information or to make a reservation, visit www.whotels.com/xian. W Xi’an is set to own the moment in mid-2018, showing off its design by AB Concept from Hong Kong. Spread over 80,000 square meters and equipped with a 17-meter high Living Room as well as 383 supremely chic guestrooms, W Xi’an is set to become the largest W Hotel in Asia Pacific. The vibrant range of rooms and suites rise up to the 20thfloor, boasting spinning skyline views along with a rooftop platform for VIPs. For electrifying experiences, guests can dive into the indoor and outdoor WET swimming pool, remix in the well-equipped FIT gym and retox in the signature AWAY Spa. Bold open-area banquet rooms of 1,128 and 2,330 square meters steal the scene for any corporate meetings, high-level launches, weddings and other glam events. For more information, please click here. This entry was posted in Hotels, Travel, Travelers and tagged Anthony Ingham, Asia Pacific, China, Marriott International, W Hotels Worldwide, W Xi’an. Bookmark the permalink.